The rectangular or oval roasting pan with two handles is perfect for cooking, roasting and stewing fish and meat. The roasting pan only truly works its magic however on large cuts of roast beef or whole birds, leaving them crispy on the outside and succulent and tender on the inside. To ensure meat is cooked evenly, cover with a heat-resistant glass or metal lid. The roasting pan is just as much at home on the hob as it is in the oven and is suitable for use on all types of hob. Made from Cromargan® stainless steel or cast iron, it retains the heat for a long time and distributes it evenly through the roast. Good to know: the roasting pan can easily be cleaned in the dishwasher. Conjure up some tasty meat and poultry dishes with the help of WMF roasting pans. Roasting pans are little marvels and are ideally suited for preparing large pieces of meat or whole birds. We have a range of sizes and designs on offer, thereby creating a wide selection of oven cookware. The all-rounder for your oven – square, oval or round. The roasting pan is designed for cooking larger pieces of meat in the oven. Our modern roasting pans are ideally equipped to do this. They consist of either square or oval receptacles that are finished either in our proven material Cromargan® stainless steel or in cast aluminium, your choice! The special cookware is always equipped with two handles, so you can easily put it into the oven and take it out. You can use most similar shallow containers for searing, frying, boiling and stewing beef, pork or poultry of any kind. It is also possible to prepare tasty casseroles with or without meat. To ensure your meat is evenly roasted, WMF roasting pans are equipped with a matching glass or metal lid. The lids are partially sealed with a silicone ring or fitted with a thermometer to ensure temperature control. In any case, the glass used is heat resistant and you can rest assured that your food will be thoroughly cooked in our roasting pans. The roasting pans in our assortment are fitted differently depending on the model. What all our cookware items have in common, though, is high quality with a clean finish, simple handling and a long lifespan. Our models are made from rust-proof Cromargan®, cast aluminium or cast iron. The shape (either square, oval or round) and type of lid (glass or metal) differ depending on the model. As a rule, our roasting pans are suitable for all kinds of hob, including induction. This is thanks to the TransTherm® universal base. The roasting pans are easy to clean and long lasting. In contrast to the high casserole, meat in the roasting pan can be left to cook in the oven for several hours. The WMF Vitalis roasting pan with a thermometer built into its glass lid is especially versatile and suitable for slow stewing.  Alongside our roasting pans and associated items, WMF has a wide range of pots and pans for vegetables and side dishes as well as other special cookware. Prepare pan-fried dishes with the wok, cook while preserving the vitamins in the steam cooker or indulge your guests with a home-made fondue.